As part of our work to support the Commotion development process, we’ve created a user interface prototype to spark more community conversation. This is a starting point – not a final product. It’s a compilation of some of our ideas around creating the most effective and accessible Commotion experience, based on our neighborhood deployment and research with users and developers. Input from the Commotion developer community will drive the next phase of our project, in which we will draft Human Interface Guidelines for the software. These prototypes utilize the graphic elements from the Commotion brand identity with the goal of creating an accessible, functional, clear and trustworthy graphic user interface (UI) for OpenWRT and OLSRd. The design is responsive and meets the needs of both a desktop and a mobile user. The graphic aesthetic is flexible and accommodating for as many users as possible through the use of large typography, white space and action icons. 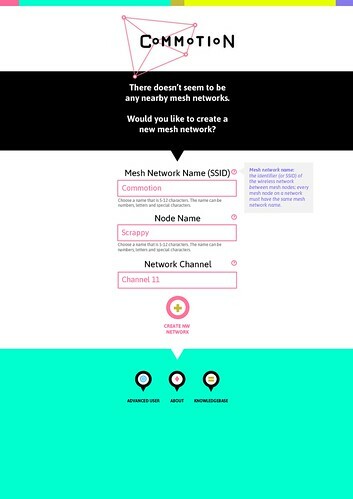 The workflow is streamlined to meet the needs of a beginner whose goal is to either set up a new mesh network or join an existing mesh network. This process is intended to facilitate the base configuration without cluttering the interface with developer or administrator functionality. However, the proposed interface also includes direct pathways to advanced functions and does not prohibit a beginning user from learning more. Overall, we wish to create a basic humanistic setup without deterring a beginner from experimenting with the deeper configuration or withholding necessary technical vernacular. At this stage, the following prototypes address points 1-3 listed above.